The players in the $600 No-Limit Hold 'em event are now on break. With 52 players remaining, the average chip stack is now 150,500. Players in the $600 No-Limit Hold 'em event at the December Mega Stack Challenge have returned from their dinner break. With 113 players remaining, the average chip stack is now 69,200. 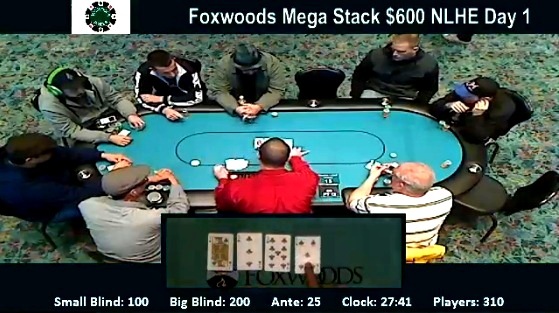 Level 10 of the $600 No-Limit Hold 'em event at the December Foxwoods Mega Stack Challenge is now underway. There are currently 188 players remaining and the average chip stack is now 41,600. We had a total of 313 players in today's $600 No-Limit Hold 'em at the Foxwoods Mega Stack Challenge. The final 33 spots will finish in the money. There are currently 260 players remaining with the blinds at 2000-400 with a 50 ante. $600 NLHE Now Streaming Live! Over 300 Players Registered! The feature table on Day 1 of the $600 No-Limit Hold 'em event at the Mega Stack Challenge is now streaming live. $600 No-Limit Mega Stack with a $125,000 GTD Now Underway! The $600 No-Limit Hold 'em event at the December Mega Stack Series is now underway!